The stem of sedges are triangular in cross-section whereas grasses are generally round or slightly flattened. This is most evident when the stems are rolled between thumb and forefinger; "Sedges have edges" is the botanical mantra. 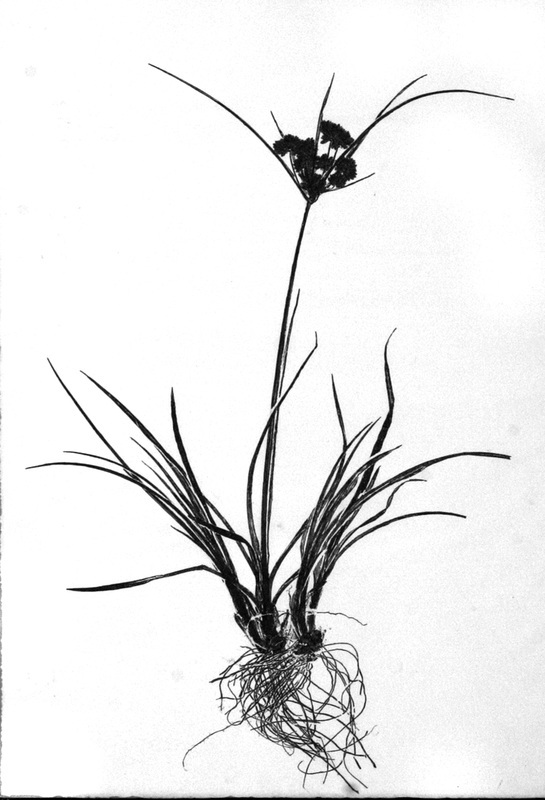 Stems of sedges are generally solid; grass stems are usually hollow or pithy. The leaves of sedges arise from the stem in ranks of three, but the leaves of grasses are paired alternately. This is most evident when looking down on the sedge, which spreads out in a triangular fashion. The fruit of sedges are achenes in which the seed is loose from the enclosing (usually) hard tissues. Similar fruit is the sunflower seed, which is pried from the enclosing shell and eaten while the shell is spit out. The fruit of grasses are fused to the enclosing tissues, for example, corn seeds (the little white embryos) are fused with adjoining tissues to form the corn kernel, all of which is eaten.